John Herbert Folker was born at 20 Russell Square in Brighton, Sussex, on 9 August 1861 and was baptised in the Chapel Royal. He was the fourth son and fifth and last child of Alfred Hanley and Eliza Folker. It is quite likely that Herbert never saw his father who had deserted the home by the time he was born. The census of 1871 shows that he and his sister Ellen are living at 31 Osborne Street in Hove with their mother. The family group was the same when the 1881 census was taken but they were now living at 28 Drove Place in Hove and Herbert was then working as an apprentice draper. According to the Electoral register of 1887, Herbert was then living at 65 Amberley Road, Westbourne Green near Paddington in Middlesex. A photograph taken by him in 1888 indicates that he was working in Guildford where brother Horace and their father Alfred were living but at separate addresses. His details have not been found in the 1891 census however, in 1901 he was boarding at the house of three spinster ladies at 36 Croydon Grove in Croydon, Surrey and was working as a stationer. Herbert became a professional photographer and set up a studio at 12 Tottenham Court Road where he rented two unfurnished rooms on the first floor from Mrs James who lived on the premises. The rent in 1906 was 19 shillings per week. Electoral registers show that the studio was at this address at least between 1905 and 1924. On 31 July 1907, Herbert married Belgian national Marie Helene Louise Jeanne van Dillen, a lady of independent means, at the Notre Dame de France near Leicester Square in London's Soho area. Herbert is recorded as being a photographic artist. Herbert's nephew Edgar Folker provided the car for their wedding. 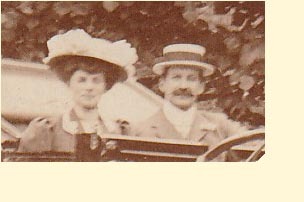 The census of 1911 shows the couple living at 53 Clifton Gardens in Paddington, Middlesex and that Herbert is a photographer. From the records, it is not clear during which period the studio was their home. Electoral registers show that Herbert was at 12 Tottenham Road at least between 1905 and 1924 and the entry in Photographers of Great Britian and Ireland virtually confirms this recording the period as 1905 to 1925. Hughes Business Directory of 1921 also confirms this address. Some of his work has been found, some typical poses but especially, a portrait of the writer Katherine Mansfield, the original of which now resides in the National Portrait Gallery in London. There is also a family photo of his niece Doady Folker. Herbert presumably retired from work around 1925 after which he and Marie moved to 36 Fairfax Road in Hampstead, London NW6 and they were still there in 1935 accoring to entries in electoral registers. Anecdotal information from the family tells that Herbert lost his mind at the end of his life and was prone to disrobing and standing in his front doorway. The registration of his death shows that he died at 1a Manor Road, Ilford in Essex on 22 May 1936 with his brother Arthur Lawrence Folker at his side. The address was that of the mental institution Claybury Hospital in Manor Road, Woodford Bridge. In his Will, he left his entire estate to his wife Marie. She passed away in 1961. Sometime during his lifetime, Herbert became the keeper of the Folker family chest which was the midshipman's chest that had belonged his ancestor Samuel Folker. The chest passed to his nephew Sydney.